Even after 25 years in the city, there is so much I don't know about London - for instance, that Leake Street in Lambeth, under Waterloo station, is an unofficial 'authorised graffiti area'. 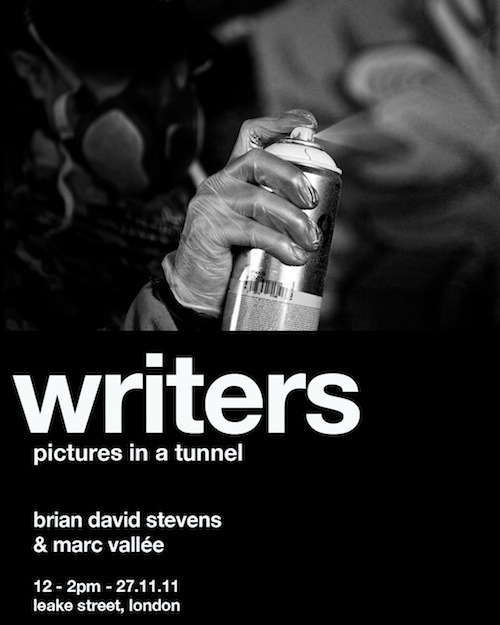 Marc Vallée, who with Brian David Stevens held a 'pop up exhibition' there today, told me the rumour that the pedestrian-only tunnel is still leased from owners Eurostar by the artist Banksy, who hosted the 'Cans Festival' there in 2008. Whether this is true or not, graffiti artists are quite obviously tolerated - nobody bothered to even glance up from their work as two police officers walking through while we were there. 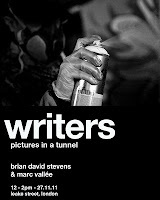 The lunchtime exhibition included images of some of these 'writers', the result of Marc's decision to work with Brian to document the London graffiti scene after eight years of photographing political protest and dissent (which is how my mate Cilius and I know him). Some of the images from this new project can be found here and on Brian's 'Drifting Camera' blog here: my more amateur efforts from Leake Street and the exhibition itself can be found in this Flickr set and below.